North Dakota Lewis and Clark Interpretive Center. Missouri River through North Dakota. Even though the Lewis and Clark Expedition experienced most of their harrowing adventures once they entered Montana, several important events occurred in North Dakota that truly helped make this epic journey a successful one. One of this events included the hiring of Sacajawea, their Indian guide who proved to be invaluable as they entered Montana and Idaho. Without her, there is a strong likelihood that many of the expedition team would have perished and the expedition itself would have been a lost cause. 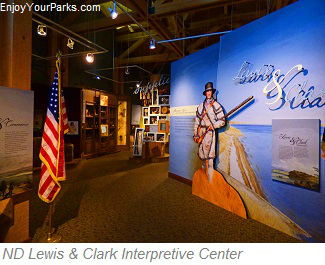 And what's interesting to note is the fact that more days were spent in North Dakota than in any other state during the Lewis and Clark Expedition, and the North Dakota Lewis and Clark Interpretive Center does a fantastic job in telling their story. center does an outstanding job with interpreting what occurred during their time in North Dakota. The exhibits are very well done, and several have sound and interactive displays. There are over 100 items from the John Fisher Collection that are representative of the items used during the expedition...which includes one of the very few working air rifles in the entire world. 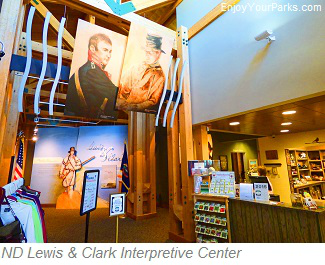 The North Dakota Lewis and Clark Interpretive Center includes not only a museum and interpretive displays, but it also is home to museum store, temporary exhibits, research library and events facility. 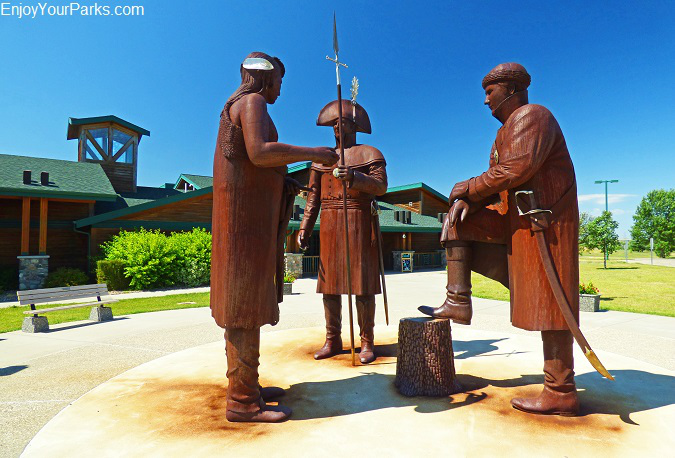 Statues of Lewis, Clark and Sacajawea standing in front of the North Dakota Interpretive Center. 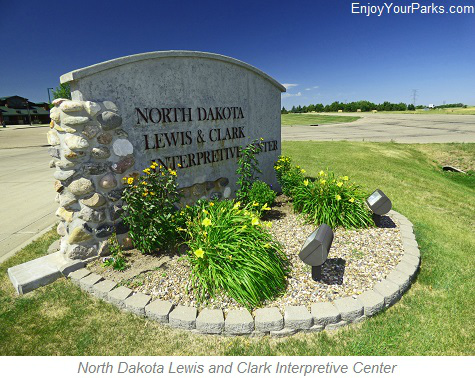 The North Dakota Lewis and Clark Interpretive Center is the heart of several additional historic area attractions, as they are all historically connected. 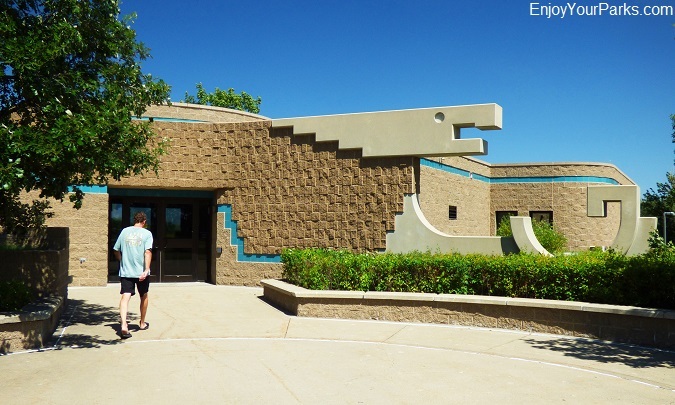 These historic places are all part of this rich history and include Fort Mandan, which is located just a few miles from the interpretive center, as well as the Knife River Indian Villages National Historic Site, found only 23 miles to the northwest of the North Dakota Lewis and Clark Interpretive Center. Expedition) spent the winter of 1804 and 1805, which was just prior to their heading into the dangerous and hostile lands which is now Montana and Idaho. 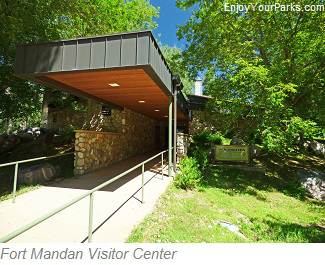 The Lewis and Clark Fort Mandan Foundation provides fascinating tours of Fort Mandan year round and also interpretive programs held daily. Lewis and Clark, along with their expedition crew, actually built Fort Mandan from the ground up so they could reasonably spend the cold North Dakota winter as comfortably as possible. And records indicate that the temperature dropped to 45 degrees BELOW zero (F) at times. 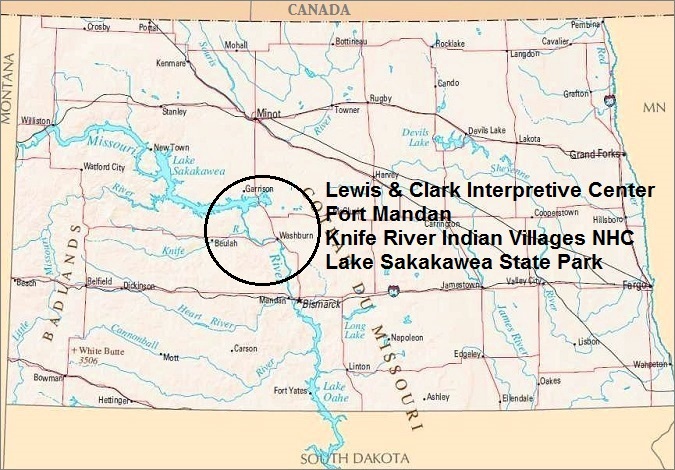 In addition to building a fort to protect them from the elements, Lewis and Clark also spent this time planning their next phase of their journey toward the Pacific Ocean...which included interviewing Mandan Indians in the nearby Mandan-Hidatsa Villages (Today known as the Knife River Indian Villages National Historic Site) and plotting maps. This is also when they had the incredibly good fortune in finding a young woman there who became their guide. Her name was Sacajawea (also spelled Sakakawea, Sacagawea). 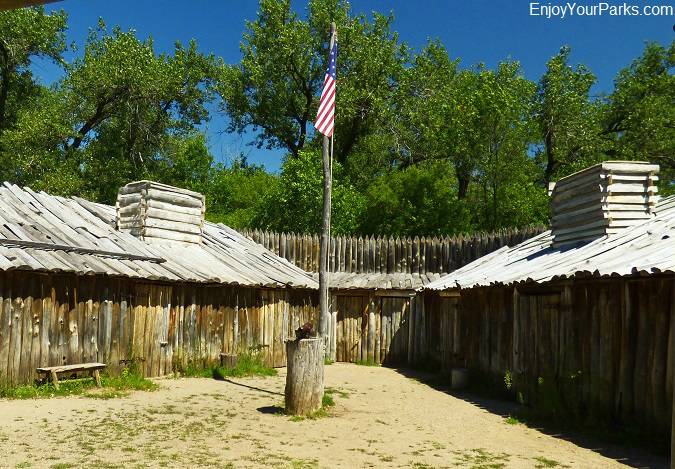 Fort Mandan was built by the Lewis and Clark Expedition to spend the winter of 1804-1805. 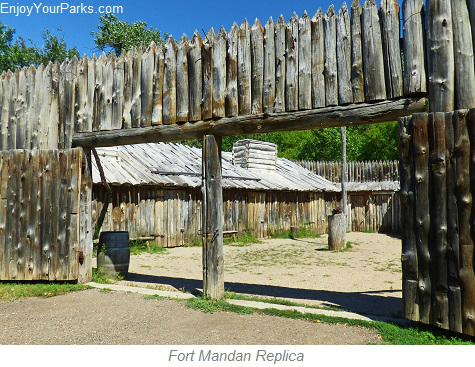 The reconstructed structures of Fort Mandan are very well done and looks very authentic, and we feel it is definitely worth spending time at if you're interested in fascinating Lewis and Clark Expedition history. 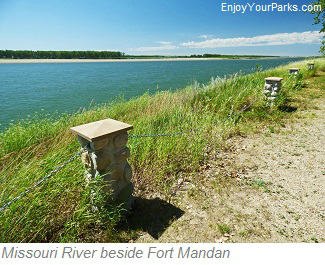 Overlooking the Missouri River, beside the fort is an interpretive center as well as interpretive displays along the shoreline. 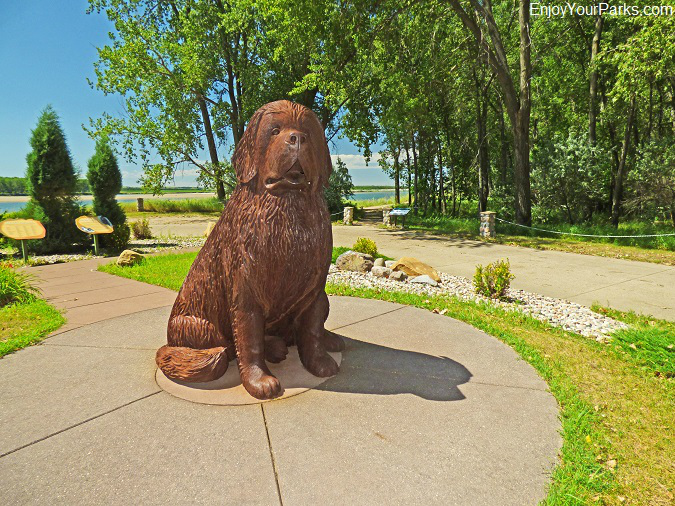 Statue of the famous dog named "Seaman" that accompanied Lewis and Clark on their epic journey. National Historic Site indeed accomplished this goal, but it also preserves the cultural history of the entire Northern Plains Indians. 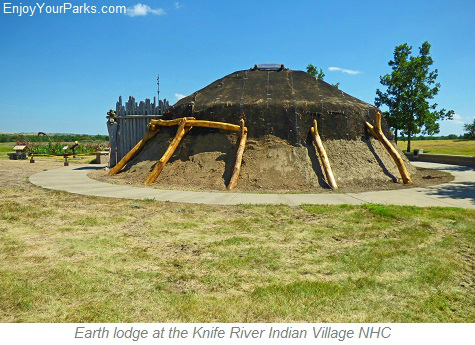 Approximately 60 miles northwest of Bismark North Dakota near Stanton, and only 25 miles from the North Dakota Lewis and Clark Interpretive Center, This location along the Knife River was a major Native American trading and agricultural area. 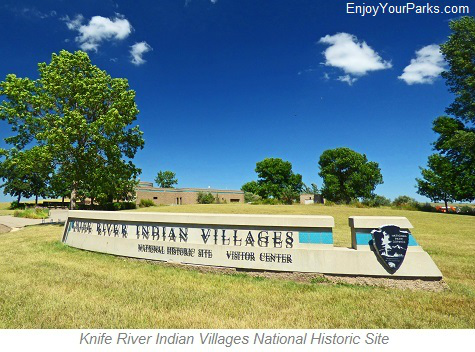 The Knife River Indian Villages are actually three separate villages that made their home along the Knife River, which were known as the Hidatsa and Mandan Villages. Established around 1600, these Indian villages thrived for hundreds of years and was the center of trade for Native Americans. They lived in earth lodges and hunted buffalo as well as farmed to provide food for themselves. Serving as a major central trading and agricultural area, the Native Americans served as "middlemen" in the trading business that stretched from Minnesota all the way to the Pacific coast. The main products that were traded consisted of guns, metals such as copper, and furs. What is truly fascinating is that the Knife River Indian Villages was the center of Indian trade for hundreds and hundreds of years prior to the influx of French Canadians and European Americans in 1750, when fur trading became a huge industry throughout the West. 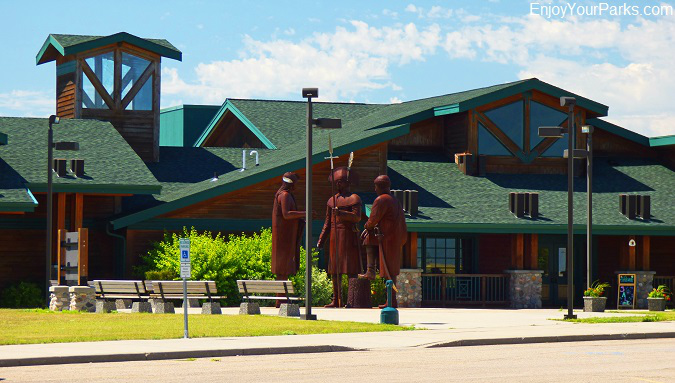 Knife River Indian Villages National Historic Site Visitor Center. with her husband Toussaint Charbonneau, who was a French Canadian trader and explorer, as well as her newborn child. Sacajawea was born near the Idaho-Montana border near Salmon Idaho and was taken to the Dakota area when she was a young girl. 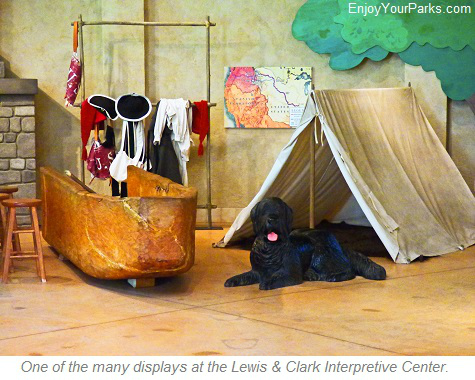 During the winter of 1804-1805, Lewis and Clark met Sacagawea, and hired her as their guide because of her connection to the Montana-Idaho area. Her husband and baby also became part of the expedition team. The hiring of Sacagawea proved to be one of the most important events of their journey because she not only remembered much of the landscape of Montana even though she was only a young teenager at the time of traveling through it, but she also provided safety from otherwise hostile Indians as they did not feel as threatened with an Indian travelling with them. Without Sacajawea, things would have more than likely turned out very much differently for the Corps of Discovery...and not in a good way. Near the Knife Rivers Indian Villages Visitor Center, there is a reconstructed earth lodge that is furnished with items that would have been present when Mandan Indians lived and thrived in them. Spending time in this earth lodge is very much worth it as you really get a feeling for how these people lived. Usually there is a staff member or park ranger that will be there to give you a very interesting and enjoyable tour of the earth lodge. 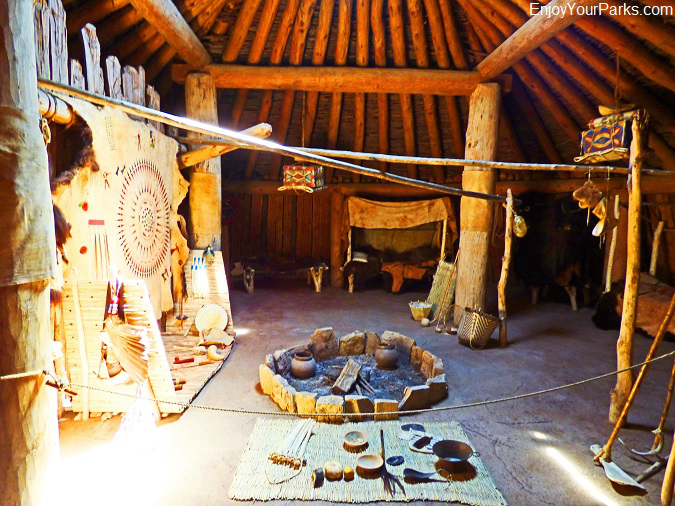 Interior of the earth lodge located at Knife River Indian Villages National Historic Site. 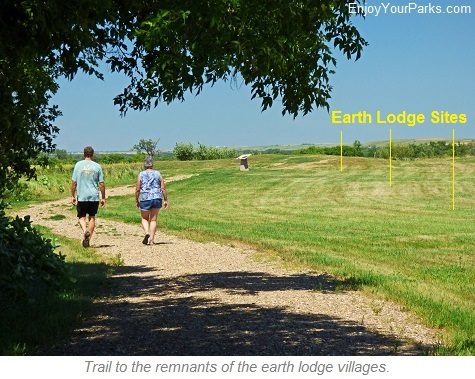 As you take the well groomed trail from the visitor center to the areas where the villages were once located, the remains of the many earth lodge dwellings can be seen as fairly big circular depressions in the earth. Some of these earth lodges were 40 feet in diameter, and could hold up to 20 families at a time, as well as some horses and some dogs. The walk along this trail is very interesting, and there are well-placed interpretive signs along the way showing you what to look for. So if you're in the mood to hike a mile or so, we highly recommend taking this fascinating walk to the original sites of the earth lodges. miles in width its widest width of 14 miles. Garrison Dam was built in 1956 which dammed the Missouri River to create the monstrous Lake Sakakawea. Built by the U.S. Army Corps of Engineers for flood control, irrigation and electricity, the Garrison Dam is the largest of the six main dams along the Missouri, and is the second dam from west to east...the first dam being Fort Peck Dam in eastern Montana. 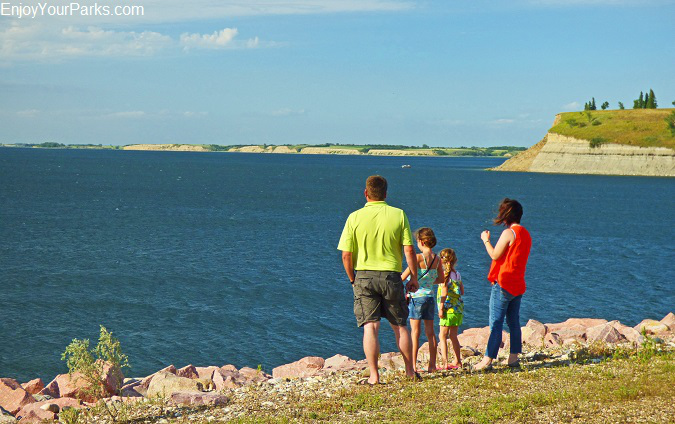 Lake Sakakawea is a water sport enthusiast's dream come true... as it provides the opportunity for just about any water sport you can come up with, including boating, fishing, water skiing, wind sailing, paddle boarding, jet skiing and much much more. Along the shores of Lake Sakakawea are a number of marinas and campgrounds for outdoor enthusiasts to enjoy. Lake Sakakwea in North Dakota. Along the south shore of Lake Sakakawea, near the Garrison Dam, rests Lake Sakakawea State Park. This popular state park provides a full service marina, convenience store, camper storage, boat storage and fishing guide services. There are two large boat ramps providing access to some amazing deep water fishing...which is some of the best on the lake, and there are modern camping and picnicking facilities throughout Sakakawea state park as well as cabins to rent, and there is a renowned hiking trail by the name of North Country National Scenic Trail that hikers thoroughly enjoy exploring the segment that runs through the state park. 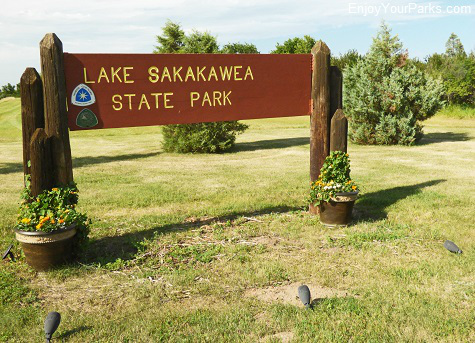 Lake Sakakawea State Park is one of the most popular state parks in North Dakota...so if you enjoy water sports, or simply love to camp in a beautiful setting with a gorgeous lake as your backdrop, then you should definitely check out Lake Sakakawea State Park during your North Dakota Vacation.